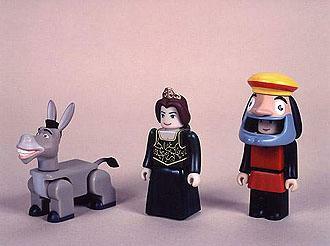 «©NCSX» Donkey, Princess Fiona and a Farquaad imposter dubbed "Mascot Boy" show up in the second set of Shrek Kubricks. The figures measure roughly 2" in height with posable limbs and Donkey also adds another 2" in length from snout to tail. This document is ©NCSX 2009. All rights reserved. No reproduction in whole or in part of this document may be made without express written consent of National Console Support, Inc.